Haj is a spritual journey, which every muslim should perform at least once in his lifetime, providing he can bear the expenses and has the physical strength. Almost 3 million people perform Haj every year - which is performed between 8th to 12th Zilhaj of the Islamic Calendar. I had the honour and privilege of performing Haj in the year 2008. To be honest I was not so excited and was a bit worried as to how the things will go and how i will be able to cope up among the crowd of 3 million people coming from almost from every part of the world with various backgrounds. The logistics, the transport, the hotels, the people I will have to cope up with. of 3 million people performing the same task at the same time. The tawaf, the Saii, and all other religious duties. 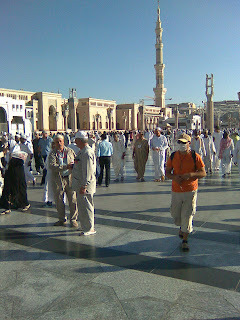 I was to land in Madina , and from there had to go to Mekkah to perform Haj and then back to the country. I have heard many stories from people who have already performed Haj and Umrah about the problems they faced and delays and people they have encountered. This added more to my woes, being a first time visitor to the hold place of Mekkah and Medina. 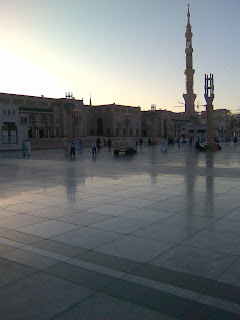 AS i landed In madina, all the things I have heard and listened seemed to be stories only. I was told that as we will land in madina airport, we would have to wait at least 6hours for the immigration and customs and to reach our hotel destination. This turned to be otherway. It took around an hour to clear the immigration process. After clearing that we were out of the airport , caliming our baggage and waiting for our bus and to board on it. But all the wait was usual and normal - and perhaps we would have to wait the same amount of time , if we were to visit any other country. The ride from the airport to our hotel in madina was about 25 minutes. Again this was a smooth ride and the city was not showing any hectic sign as at this time around in madina it was estimated to have around 1.5 million people. We reached our hotel , which was next to haram - movenpick anwarul madinah , which was just next door to haram / masjid e nabwi. As like in any other country , facing high toruist season with lots of check ins and check outs hapenning every time - WE face the same situation. Once we were in our hotel room , it was like anyother 5 star hotel room anywhere in the world - with every thing in order and fixed. Normally you would experience not so good service in the hotels which are having high toursit season, and at times some fixtures in the room not in order . But that was not the case - Hotels and rooms were in top mint condition and in order - clean. Accomodation was one of my big concern , and I was very releaved to have a good nice cozy room, with access to haram just less than 2 minutes walk. 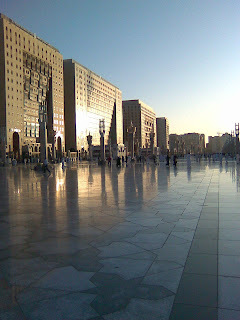 The first picture is the view of the hotel buidlings from inside in the haram - And was taken at sunrise - one of my favorite photograph. Acessing haram was easy - just walk down the hotel and you are there in the haram - Just a few more steps and you are inside masjid e nabwi. Finding a nice place in masjid e nabwi is tricky. As people tend to occupy the first available space as soon as they enter the masjid. This leave the middle section of the masjib empty. So when you enter the masjid, you might find it occupied and filled -this is mainly because majority of the people take their place as soon as they enter the masjid. I had a few difficulties in finding agood place for my self for the same reason , but as i explored more , I was able to find a suitable place for myself. Just a word of caution is to take an extra ja-e-namaz (prayer mat) in case you still cannot find a place, you can occupy the lobbies. The market around haram is developed and spacious - you can find every thing you require, from food to medicine to mobile cards and road side shopping. Madina has well developed malls which cater all type of items from jewellery , perfumes, itar , dresses etc - so in case you get some time out from prayers - you might want to check the malls which are just next to haram and majority of them in the hotel building. Madinah it self is stunning, spectacular views, very peaceful. And yes, once you starts adjusting you will know that it is not very difficult to adjust your self in a crowd of so many , as they are there for the same purpose as you are - and tend to have a soft corner for every one - which makes life very much simpler and easier. Madina it self seemed and felt very peaceful and quiet.